Since the NDP Government took power in July 2017 they have been relatively quiet on the housing front. This comes amidst sweeping promises to bring drastic measures to the housing market, some of which included a 2% absentee speculators tax, an agency task force to prevent money laundering, and a rebate for renters. However, just one week away from their budget announcement on February 20th, the NDP Government hinted at what’s to come. Guichon’s remarks hint towards a much anticipated real estate speculation tax. If so, it will be a hefty blow to property flippers. It could further erode profits of detached house flippers, many of whom have been caught eating losses with that segment of the market having gone stale. Meanwhile, Vancouver condo flipping, which hit a 9 year high, could be in for a rude awakening. In 2017, nearly 11% of all condo sales were previously bought and sold within a 24 month window. Roughly a 74% increase from the year prior. 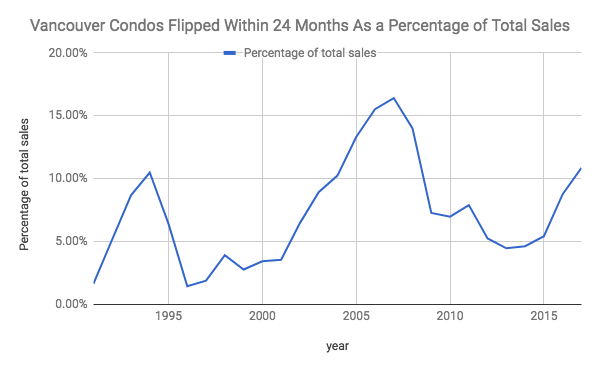 Vancouver condos flipped as a percentage of total sales. It could also wreck havoc on the pre sale condo market which has become highly speculative. Many pre sale condos are fetching a 20-25% premium above current market value as buyers chase ever higher prices. With this kind of impact it begs the question if the NDP will really go to such great lengths to quash property flippers. 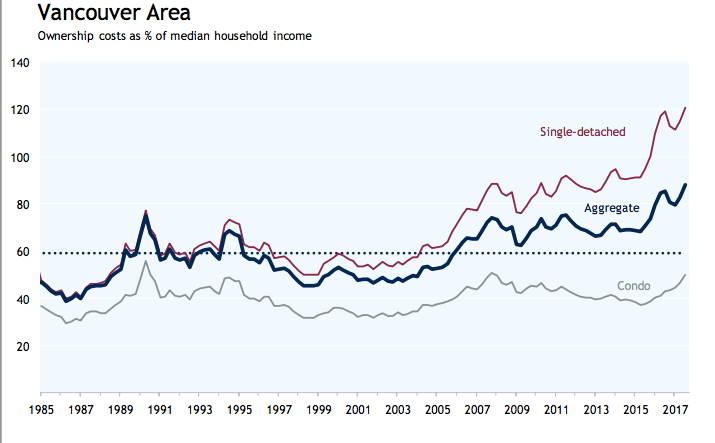 However, with the housing crisis having stretched home prices to the most unaffordable levels in recent history, all levels of Government are piling on. Recent measures have included, a 15% foreign buyers tax, a ban on shadow flipping, an increase of property transfer tax, an 11% tax on Airbnb rentals, and an empty homes tax in Vancouver. That list could grow longer on February 20th.